Activism isn't always about waving signs and using a megaphone to demand change from the elite and aloof powers that be. Sometimes it's about having a cup of mint tea with a random person off the street and asking them what they think is wrong with their corner of the world. 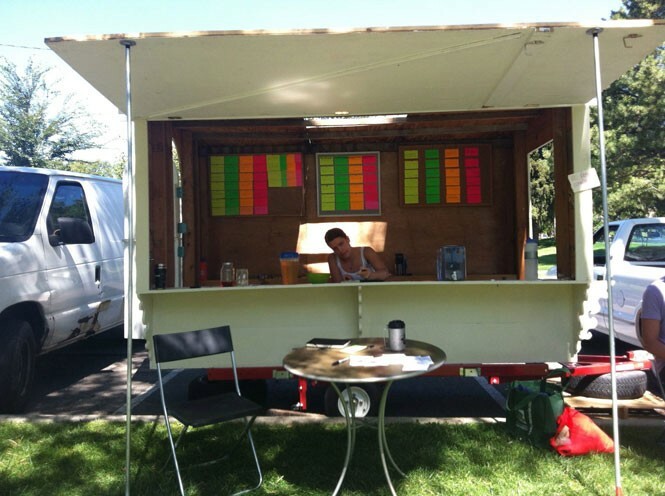 That's the goal of the People's Listening Project, which travels to parks and public spaces around Salt Lake City, asking everyday citizens to vent. "We're not saying, 'Listen to us for two hours,'" says organizer Renae Widdison. "We're saying, 'Tell us what you think.'" The People's Listening Project is not political, nor is it an organization with a specific cause. It's more a way to gather feedback from average citizens—especially those who feel ignored by the mainstream—and provide them a forum to find and network with others passionate about their causes so they can organize for change. The project is supported by some prominent local organizations, such as the climate-justice group Peaceful Uprising; the Salt Lake Dream Team, which advocates for compassionate immigration reform; and Move to Amend Salt Lake, which has pushed for a constitutional amendment to prevent corporations from being able to give limitless political campaign contributions. But coordinators of the People's Listening Project say they put their personal passions aside just to hear people out. "It's been really refreshing to not make any demands on people," says Natascha Deininger, one of the group's organizers. She says that simply by asking to listen to a person's concerns for 10 minutes, the group can reach people who otherwise wouldn't be interested in joining a cause or getting involved in the political process. "And then some people have stayed an hour," Deininger says. The group has taken its mobile listening cafe to parks around the city and heard from folks from all walks of life, asking what people worry about in the future, what social issues impact them the most, what issues are impacting their communities and what they would like to see happen to resolve it. The project has heard from high schoolers worried that standardized tests don't prepare them for the future, and from folks concerned about workplace discrimination, crime on their blocks, and financial insecurity. One 6-year-old said he was worried about being bullied at a new school; his friend added that he was afraid there was a hobo spider in his house. Deininger recalls an 8-year-old who talked about being worried about burglaries in her neighborhood. When project members asked what could be done, she opined that she wished that everyone had money so they wouldn't steal. "That blew us away," Deininger says. At Pioneer Park, the group met with many homeless individuals who spoke of a heavy-handed police presence, but also about the problems that afflict them. "They said, 'Look, my addiction is a barrier for me, and the presence of drugs in our community is a major issue,'" Widdison says. "There's a lot of self-awareness in that community." One man told them that while there is always food and shelter in Salt Lake City, no charity or agency ever tries to engage with the homeless by offering anything like arts classes or sports at the park that could keep homeless people out of trouble. The organizers want to eventually hold an exhibit showcasing all the concerns and suggestions they've heard, and offer a venue where people can then form independent groups to effect change for causes they're passionate about. Deininger says she's already seen positive results. Sometimes, she says, people just need to talk something out before deciding to take action. "A lot of people don't necessarily need someone to tell them a solution to their problems," Deininger says. "A lot of times they actually know what it is." E-mail deininger.natascha@gmail.com for more information or to volunteer. The People's Listening Project will be at the People's Market (1000 S. 900 West) on Sunday, Oct. 5, from 10 a.m. to 3 p.m., weather permitting.